A simple survey shows that as many as 90% of the people in the Universe will be under the influence of Mangal Dosha. Every one of us, at one time or the other, will hear about Mangal. The word is more prominently heard when horoscopes of the bride and bridegroom are studied before their marriage. Unfortunately, in almost all of the cases, we tend to be very much worried about the presence of the Mangal dosha in the natal charts that we begin to feel that certain things in life, such as marital life for instance, will get disturbed or worse they are deprived of. Before we proceed further, it is important for us to be clear that Mangal is not a matter to be afraid of and it is not the end of the world for them. Matters pertaining to the intensity of the Mangal Dosha and its cancellation play major roles and we shall attempt to study about Mangal, Mangal dosha and various related aspects. 'Mangal' means 'burning coal' or 'a fair person'. Mangal is identified with Lord Kartikeya - the God of War. He is the son of Lord Shiva. Kartikeya was born with six heads. He killed the invincible demon Taraka and released the Devas from Taraka's oppression. These qualities of Mangal depict strength, courage and the protective quality of Mangal. Thus, Mangal is known as the protector of dharma and the purpose in life, which each of us follow.Another notion of Mangal is that 'Ku' stands for 'Earth' and 'Jha' means 'birth'. Hence, Mangal will mean 'the son of Earth'. He is brought up by six Krutika stars resulting with six faces because he is fed by six star mothers. That is reason why he is also called Shanmuka. One of the biggest misconceptions and fears in the Hindu society with respect to marriage is the presence of Mangal Dosha in the natal horoscope. 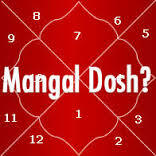 Mangal dosha occurs, when Mangal is placed in the ascendant, 4th, 7th, 8th or 12th house of the natal chart. However, majority of the astrologers include the 2nd house also in the Mangal dosha list. People in whose natal chart Mangal is placed in the above positions are under the influence of Mangal. Mangal is considered to be a commander-in-chief among all planets. It symbolizes immense courage, aggression, vitality, confidence and warrior qualities. It drives the fire of independent spirit and sense of purpose among individuals. Some of the most common misconceptions about the planet Mangal is that if a person is born on a Tuesday, he is said to be dominated by Mangal. This, however is not true. Mangal in his own house or exaltation will considerably reduce the ill effects of the Mangal Dosha. The most famous misconception about being a Mangal is that if he/she is married to a non-Mangal, then the spouse is bound to die. The above can be seen in a few cases, where Mangal is severely afflicted; overall strength of the horoscope also needs to be checked. Mangal in the first house - quarrelsome on even minor issues; combative and dominating in relationship. Mangal in the 2nd house - harsh speech. Mangal in the 4th house - aggressive emotional nature, which may effect the career-front, with frequent changes in profession. Mangal in the 7th house - a lot of energy; differences with family members. Mangal in the 8th house - early death of the mate. Mangal in the 12th - financial losses, many enemies and repressed anger. According to Parasara's Brihat Parasara Hora Shastra, if Mangal is placed in the lagna, 4th, 7th ,8th and 12th houses, without any aspect or conjunction of the benefit planets, then the husband of such a women certainly have an early death. Hence it is understood that if Mangal has an aspect of a benefit or is conjunct with a benefit, then there is no dosha. An exception to this however exists. "If a woman with the widowhood yoga marries a man with a similar yoga of loss of spouse, then such yoga will get cancelled." Hence the second exception given by him is that Mangal Dosha is canceled, if both the girl and the boy have Mangal Dosha. When Mangal is in its own sign Mesha, exalted Karkataka or in the houses owned by planets considered to be his friends viz., Ravi, Guru and Chandra. If Mangal is in the 2nd house, but in the signs of Mithuna or Kanya. If Mangal is in the 7th house, but in Karkataka or Makara. If Mangal is in the 8th house, but in Pisces. If Mangal is in the 12th house, but in Vrushaba or Tula. For Karkataka and Simha lagnas, Mangal is a yoga Karkataka and so no dosha wherever it is placed. If Mangal is in conjunction or aspected by Guru or Chandra. If Mangal is in conjunction or aspected by Ravi, Budha, Sani or Rahu. Mangal Dosha is considerably reduced, if Sani aspects the houses owned by Mangal, but subject to the other planetary positions in the natal chart. Remember that even if a person has severe Mangal Dosha, after the age of 28, the effects of Mangal Dosha are reduced. People who are afflicted with severe Mangal Dosha should marry a person having the same quantum of Dosha. Also such people should worship Lord Hanuman daily, by reciting Hanuman Chalisa. They should visit the temple of Lord Hanuman on Tuesdays. Another remedy is to keep an idol of Kesariya Ganapati in the pooja room and worship Him everyday. Vamtantra advices some general remedies as per following for manglik persons to do personally for their benefit. · A manglik should have a manglik partner. · Always worship lord hanuman and should recite hanuman chalisa morning and evening. · Manglik's must visit hanuman temple on every tuesday and saturday for hanumat darshan. · Every Manglik must give daan of jaggery(gur) and masur dal time to time on tuesdays. · A manglik person should take part in our bhandara programme on akshaya tritiya(Giving ann and vastra daan on akshaya tritiya reduces the manglik dosha & malefic effects of retrograde Mangal). Vamtantra conducts the following special puja's for manglik dosha nivaran. Remittences for vishist Mangal graha shanti puja - manglik dosha nivaran is Shri Mangal Graha puja, ganesh poojanam, pranprathista, shodashopachar or sixteen step puja ceremony poojanam, namavali, vrihad mantrajapa, purnahut, homam and visarjan. Apart from these we also conduct Shree Mangal yantra poojanam and any other specific tantrik pooja as per the requirement in Seventh house of horoscope. Remittences for vishist mangla gauri puja - manglik dosha nivaran is Shri Mangla Gauri puja, ganesh poojanam, pranprathista, shodashopachar or sixteen step puja ceremony poojanam, namavali, vrihad mantrajapa, purnahut, homam and visarjan. Apart from these we also conduct Shree Mangla Gauri yantra poojanam and any other specific tantrik pooja as per the requirement in Seventh house. Remittences for vishist hanumat tantrik puja - manglik dosha nivaran iswhich includes Shri hanumat puja, ganesh poojanam, pranprathista, shodashopachar or sixteen step puja ceremony poojanam, namavali, vrihad mantrajapa, purnahut, homam and visarjan. Apart from these we also conduct Shree hanumat yantra poojanam and any other specific tantrik pooja as per the requirement in Seventh house of horoscope. Remittences for vishist katyayini tantrik puja - manglik dosha nivaran is which includes katyayini puja, ganesh poojanam, pranprathista, shodashopachar or sixteen step puja ceremony poojanam, namavali, vrihad mantrajapa, purnahut, homam and visarjan. Apart from these we also conduct Shree katyayini yantra poojanam and any other specific tantrik pooja as per the requirement in Seventh house of horoscope. Remittences for vishist uma maheshwar tantrik puja - manglik dosha nivaran is which includes uma maheshwar puja, ganesh poojanam, pranprathista, uma maheshwar vivah puja ceremony poojanam, namavali, vrihad mantrajapa, purnahut, homam and visarjan. Apart from these we also conduct Shree uma maheshwar yantra poojanam and any other specific tantrik pooja as per the requirement in Seventh house of horoscope. Remittences for vishist ramjanki vivah tantrik puja - manglik dosha which includes ramjanki vivah puja, ganesh poojanam, pranprathista, ramjanki vivah puja ceremony poojanam, namavali, vrihad mantrajapa, purnahut, homam and visarjan. Apart from these we also conduct Shree ramjanki yantra poojanam and any other specific tantrik pooja as per the requirement in Seventh house of horoscope. (Instead of clay pot, the kumbh vivah can also be performed with either banyan tree or Lord Krishna-vishnu swaroop). Remittences for vishist kumbh vivah tantrik puja - manglik dosha nivaran is which includes kumbh vivah puja, ghat-kumbh-banayan tree-vishnu swaroop pranprathista, vivah puja ceremony poojanam, namavali, vrihad mantrajapa, purnahut, homam and visarjan. Apart from these we also conduct any other specific tantrik pooja as per the requirement in Seventh house of horoscope.